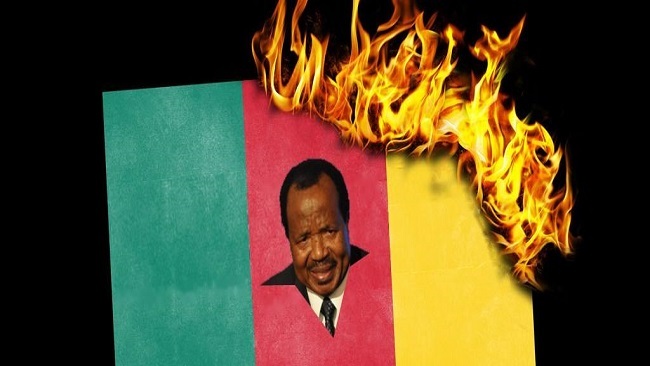 A senior member of the Yaoundé Francophone regime has told Cameroon Intelligence Report that the country is no longer under the control of President Biya and his forces. The French Cameroun political elite who hail from the South region also said the Ambazonian Restoration Forces stand a better chance of taking control of more territory deep inside French Cameroun. The CPDM MP and Central Committee member who sued for anonymity further pointed out that the mismanagement of the crisis in Southern Cameroons and Biya regime’s excessive use of force against innocent Ambazonian civilian population has made the situation more intractable. An indefinite dusk to dawn curfew has been imposed on Southern Cameroon’s Northern Zone after the Minister of Territorial administration, Paul Atanga Nji and his gang reportedly staged armed attacks on buses in Bamenda late on Saturday and blamed it on the Ambazonian Restoration Forces. Cameroon Intelligence Report understands the Francophone Northwest governor Adolphe Lele Lafrique said the curfew between 6pm and 6am from Sunday will remain effective till further notice. The attack on buses is also apparently the reason that the Francophone army retreated from the Southern Cameroons suburbs to the main motorways linking French Cameroun to Southern Cameroons. Cameroon government sources have also reported that the 85 year-old President Biya has for the 9th time decided to split the responsibilities of his top military officers, taking away from non Beti Ewondo army generals the sole mandate for dealing with the crisis that has gripped La Republique du Cameroun in the Far North, the East and presently in Southern Cameroons. The mandate in Buea, the chief city in the Southern Zone was recently passed partly to a Francophone colonel after General Melingui was sacked and ever since he took over control, the colonel has been responsible for military operations and repression including arrest of Southern Cameroons resistance forces. Cameroon Intelligence Report also gathered that President Biya’s relatives in the army and in the gendarmerie are now imposing a blockade on families of the Cameroon political establishment, in order to prevent them from leaving the country. If these intelligence that were handed over to our senior political correspondent in Yaoundé are correct, they point to a very heavy pressure on Biya and his French backers, and indicate fear bordering on hysteria as to what is happening in the nation’s capital. Despite troubling signs of a major crack within the army and the police, the highest ranks of the military billionaires are still loyal to the CPDM regime. Many junior officers who were recently deployed to Southern Cameroons simply defected and escaped to the Ivory Coast via Nigeria. It is not clear whether the Ivorian government is aware of the presence of many French speaking Cameroonian soldiers on its territory. Violence continued over the week end as the Ambazonian Interim Government reported that several Southern Cameroons civilians were killed by Cameroon government forces in restive areas on the outskirts of Buea, Bamenda, Manyu and Wum Counties. The deaths in the Wum and Mamfe areas included 27 teenagers and two women. The African Union and the UN Security Council are not seeking military action to end the bloodshed in Southern Cameroons.